GRUSHENKO: To die . . . before the harvest. The crops, the grains, fields of rippling wheat. Wheat. All there is in life is wheat. . . . Oh, wheat! Lots of wheat! Fields of wheat! A tremendous amount of wheat. . . . Yellow wheat. Red wheat. Wheat with feathers. Cream of wheat. SONJA: The last traces of the shimmering dusk are setting behind the quickly darkening evening, and it’s only noon. Soon we shall be covered by wheat. NATASHA: Did you say . . . wheat? SONJA AND NATASHA: Wheat . . .
GRUSHENKO: Wheat! I’m dead, they’re talking about wheat. In its historical setting, plot, characters and atmosphere, Woody Allen’s feature film Love and Death (1975) parodies the nineteenth-century Russian novel in general and Tolstoy in particular. At the time of the film’s release, this would have been obvious to many viewers who had not necessarily read War and Peace from cover to cover: King Vidor’s spectacular big-screen adaptation of the novel, starring Audrey Hepburn and Henry Fonda among other famous names, had been released less than two decades previously, in 1956. And by the mid-1970s, when Woody Allen shot his film in Hungary, there were more than a half a dozen cinematic versions of Anna Karenina in existence. Through the names of its characters, their morbid love lives, their frequent agonising over the existence of God, and in verbal allusions such as a madcap dialogue involving wordplay on the titles of Dostoevsky’s novels, Love and Death also makes reference to Russia’s other towering nineteenth-century literary figure. Nor were Hollywood versions of Dostoevsky’s novels lacking; they included a 1958 MGM production of The Brothers Karamazov, starring Yul Brynner as a bald Dmitri Karamazov. In general, Love and Death employs comic versions of the types and situations one might expect to find in a classic Russian novel. Although they are obviously important as somehow a quintessentially Russian leitmotiv, the film’s allusions to wheat would seem harder to pin down, however. On the eve of his duel with aristocrat and marksman Anton Lebedekov (Harold Gould), the bumbling Boris Grushenko (Woody Allen), who since boyhood has had visions of a white-robed, scythe-wielding Death, waxes lyrical about fields of rippling wheat and dying before the harvest. At the end of the film, Grushenko, having been executed by firing squad for his botched attempt to assassinate Napoleon, is being led away by the aforementioned Grim Reaper when his cousin Sonja (Diane Keaton) and Natasha (Jessica Harper) fall into a trance and begin uttering the word “wheat” in a droning threnody. What Russian novel might these ecstatic evocations of wheat be alluding to? In Love and Death, the wheat motif occurs at liminal moments, on the threshold of death, between this world and the next, when the characters’ gaze seems to be fixed on some plane beyond the visible. In Tolstoy, however, the references to wheat would seem to be firmly rooted in this world rather than the next. For Tolstoy’s characters, wheat has an economic and an agronomic sooner than a metaphysical meaning. For example, in War and Peace, after giving his wife a thrashing, Yakov Alpatych, Bolkonsky’s estate manager, takes tea with innkeeper and grain dealer Ferapontov, and they talk about the price of wheat and how the weather is likely to affect the harvest. In Anna Karenina, Levin takes pleasure in the “velvety” vistas of green wheat he sees when out riding on his estate. Although Tolstoy does not explicitly mention the fact, we may assume that the said velvety vistas of wheat ripple. But otherwise, Levin’s interest is pragmatic: the harvesting of the wheat, the delivery of the wheat, how much money the wheat is expected to fetch at market. It is to Dostoevsky that we must turn if we are to glean hints as to the mystical meaning of wheat that is seemingly parodied in Grushenko’s ecstatic vision. The epigraph to The Brothers Karamazov is the parable of the grain of wheat from the Gospel according to St John: “Verily, verily, I say unto you, Except a corn of wheat fall into the ground and die, it abideth alone: but if it die, it bringeth forth much fruit” (John 12:24). Elder Zosima quotes the verse to Alexey Karamazov when he tells him of the terrifying fate he has foreseen looking in his brother Dmitri Karamazov’s eyes. Symbolist poet Vyacheslav Ivanov suggested a link between the name of the character Dmitri, who in the novel makes a spiritual descensus ad inferos, and Demeter, the goddess of the grain, whose daughter Persephone is abducted by Hades/Pluto and becomes queen of the underworld (i). Notwithstanding the eschatological corn of wheat in The Brothers Karamazov, in Dostoevsky’s novels fields of wheat, rippling or otherwise, are wholly absent. Unlike landed aristocrat Count Leo Tolstoy, Dostoevsky “nearly never attempts to describe a rural landscape or the open country” (ii). The rural landscapes of boundless Russia do figure prominently in the novels of Ivan Turgenev, however. In Fathers and Sons, for example, the sight of rippling fields (a “waving sea”) of ripening wheat and whitening rye dispel Bazarov’s friend Arkadi’s melancholy thoughts. The natural world is part of the immanent reality within which Turgenev’s characters develop. 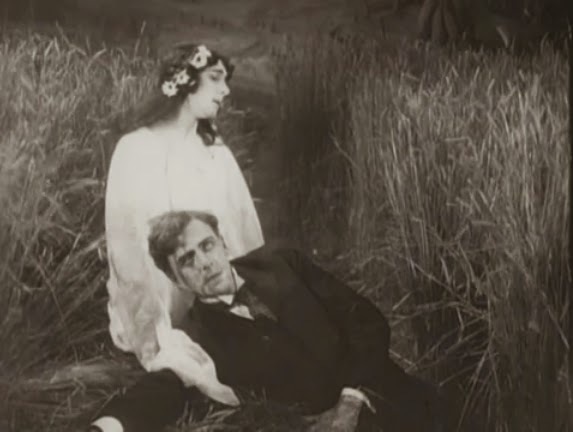 But it is very much an eschatological wheat field that can be found in After Death (После Смерти, 1915), Yevgeny Bauer’s silent film adaptation of Turgenev’s short story “Clara Militch”. Yakov Aratov, a young, melancholy and rather reclusive man of twenty-five, a photography enthusiast who lives with his maiden aunt, rejects impetuous actress Clara Militch when she unexpectedly declares her love. She goes on to commit suicide by poison, dying on stage during a performance, and subsequently appears to Aratov in a dream, beckoning him to follow her. In Turgenev’s story, the landscape of the next world is barren, lifeless: Aratov dreams he is “on a bare steppe, strewn with big stones, under a lowering sky” (iii). But in Bauer’s film, the ghost of Clara Militch—wreathed with flowers, like Persephone when Hades snatches her down into the underworld—approaches Aratov through a field of ripe wheat. Aratov becomes obsessed with Clara Militch, falling in love “with a dead woman, whom he had not even liked in her lifetime” (iv). In the story, she appears to him again in his sleep, this time at the end of a convoluted dream, which shifts from a sinister manor-house to a withered orchard and then to a lake, which symbolises the waters over which the dead cross to the other world. The dream (of the kind that Jung was to call the adumbratio) foreshadows Aratov’s death: he awakes to find the ghostly presence of Clara Militch in his room, he is enraptured and goes to her, they are united in a kiss, and he falls into a delirium, later dying with a rapturous smile on his lips. 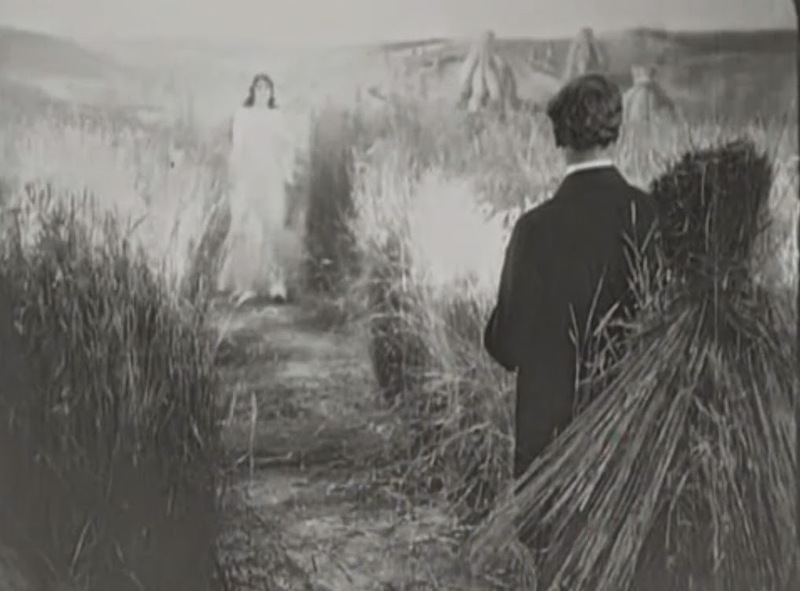 In the film, however, the scene of the second dream is the same wheat field as in the first vision. This time, Aratov is asleep in the corn; Clara Militch awakens him and they embrace, their eyes eerily fixed on some point above and beyond the frame, rather like Grushenko and Sonja in the scene in Love and Death where Woody Allen’s character, likewise on the threshold of death, is transported by his vision of fields of rippling wheat and cream of wheat. Sonja’s closing speech in Love and Death could almost be an indirect parody of Sonya’s effusion in Caylor’s sentimentalised version of Chekhov. A contemporary account of the Jed Harris production describes the “Chekhov spirit” as a “sad, amusing dream”; like the male cast of Love and Death, Astroff, Serebrakoff and Uncle Vanya are accoutred with the visual signifiers of nineteenth-century Russianness: “long whiskers” and “tall boots” (vii). The “wheat fields” are the culmination of this nostalgic vision of the pre-Soviet Russian spirit, one that can be found in almost every film and costume drama set in the period of the classic Russian novel. Expressing vaguely mystical yearning, maudlin tragedy and premonition of death in an image that conjures up the boundless expanses of Mother Russia, the wheat motif in Love and Death ultimately alludes to and parodies not the Russian novel or drama but the reception of Russian literature in the western imagination and popular culture, a highly stylised and simplified version of nineteenth-century Russianness. (i) Ksana Blank, Dostoevsky’s Dialectics and the Problem of Sin, Northwestern University Press, Evanston, 2010, p. 41. (ii) George Steiner, Tolstoy or Dostoevsky, Penguin, Harmondsworth, 1967, p. 90. (iii) Ivan Turgenev, Dream Tales and Prose Poems, translated by Constance Garnett, Macmillan and Co., New York, 1897, p. 54. (v) Laurence Senelick, The Chekhov Theatre. A Century of the Plays in Performance, Cambridge University Press, Cambridge, 1997, p. 181. (vi) Anton Chekhov, Uncle Vanya, translated and adapted by Rose Caylor, Covici Friede Inc., New York, 1930. 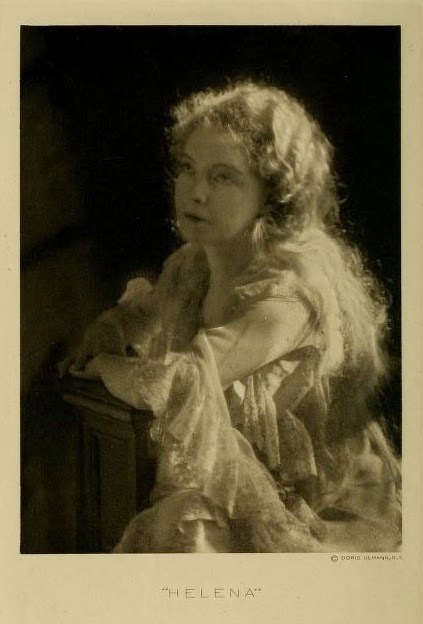 (vii) Arthur Bigelow Paine, Life and Lillian Gish, The Macmillan Company, New York, 1932, p. 276-277. Cartea de grâu, ed. Șerban Anghelescu, Cosmin Manolache, Lila Pasima, Editura Martor, Bucharest, 2014, pp. 37-41.